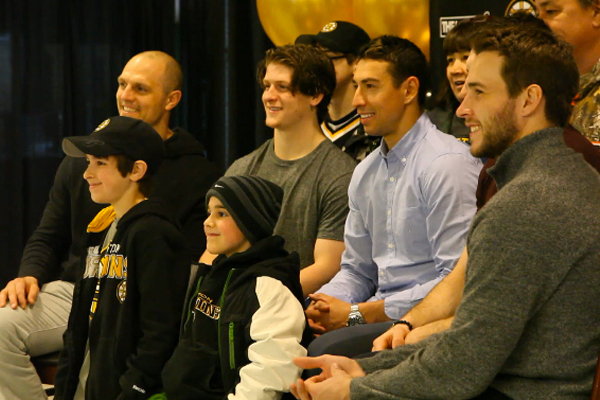 BOSTON, MA - As the Bruins hit the ice for Monday’s practice, they were greeted by some special visitors — more than 600 of them, to be exact. The lucky winners of the Massachusetts State Lottery Boston Bruins VIP Practice Experience had the opportunity to watch a B’s practice that featured plenty of special teams work and conditioning drills as the team prepares to face the Sabres in Buffalo on Wednesday night. After practice, Bruins President Cam Neely addressed the crowd, followed by Assistant Coach Doug Jarvis, who issued a quick “Chalk Talk.” The fans even had the chance to meet and take photos with some of the Bruins, including Dennis Seidenberg, Torey Krug, Chris Kelly, Jordan Caron and Matt Bartkowski. Monday’s session was an extra special one for the fans, as it marked the first day back on the ice for forward David Krejci and defenseman Zdeno Chara since returning from their Olympic experience in Sochi. It was also particularly special for two young fans, Adriana and Sophia, who almost didn't make the journey with their mom due to some challenging car trouble. All was well, though, when they finally arrived at TD Garden and got to see one of their favorite players, Milan Lucic, on the ice in the Spoked-B. Two fans in attendance, Jeff and Jason, who have been B’s fans for over four decades, agreed that Monday’s event was a once-in-a-lifetime experience. For them, having the opportunity to get an insider’s perspective from Jarvis was the best part of the day. “That was great — very informative. We really enjoyed it,” said Jason. Jarvis enjoyed being back at TD Garden just as much as the fans did, with the team's last home game coming all the way back on February 8. Jarvis spoke about the team’s itinerary for the upcoming road trip to Buffalo, and he gave the fans some insight into what an average day in the life of a Boston Bruin entails — from the time the B’s arrive at the rink, to what they eat for their pregame meals, to how they prepare for each and every opponent. Jarvis also took a few questions from the crowd, touching upon the unique experience of being followed around by cameras for Behind The B, as well as what it was like to watch five of his players (plus Head Coach Claude Julien and General Manager Peter Chiarelli) and their journey to the Olympics. He even got a chance to talk about his own experiences playing in the NHL. All in all, everyone on the ice was excited to have an audience, just as the fans were thrilled to see their Black & Gold in action.